ABERDEEN, S.D. 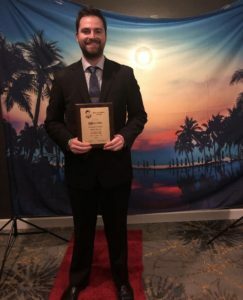 (HubCityRadio.com) – Hub City Radio’s David Tukesbrey took home an Eric Sevareid first place honor during this past weekend’s Midwest Broadcast Journalists Association Awards Banquet in the Twin Cities. Tukesbrey was honored in the Sports Play-by-Play Small Market Radio category for “Five Minute Offense in Iowa,” during his call of Presentation College football this past fall. A native of Libertyville, Ill., Tukesbrey is in his fourth year with Hub City Radio.